The development of materials for clean and efficient energy generation and storage is one of the most rapidly developing, multi-disciplinary areas of contemporary science, driven primarily by concerns over global warming, diminishing fossil-fuel reserves, the need for energy security, and increasing consumer demand for portable electronics. Computational methods are now an integral and indispensable part of the materials characterisation and development process. 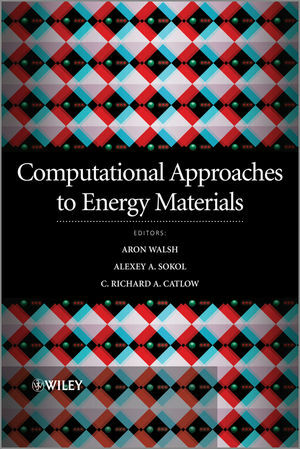 Computational Approaches to Energy Materials presents a detailed survey of current computational techniques for the development and optimization of energy materials, outlining their strengths, limitations, and future applications. The review of techniques includes current methodologies based on electronic structure, interatomic potential and hybrid methods. The methodological components are integrated into a comprehensive survey of applications, addressing the major themes in energy research. This full colour text is an accessible introduction for newcomers to the field, and a valuable reference source for experienced researchers working on computational techniques and their application to energy materials. Professor Richard Catlow is the Dean of the Faculty of Mathematical and Physical Sciences at University College London and a Fellow of the Royal Society. He has worked in the field of computational and experimental studies of complex inorganic materials for over 30 years, pioneering a wide range of applications of computational techniques. His current research involves exploring the structures, properties and reactivities of complex materials including micro and mesoporous catalysts, electronic ceramics, minerals, fast ion conductors and molecular materials. Professor Catlow has published over 800 papers and authored or co-authored 12 books, including the widely used Computer Simulation of Solids and the influential Computer Modeling of Microporous Materials. Dr Alexey Sokol is a Senior Research Associate at University College London, where he has worked on the development and applications of computational methods for solid-state physics, chemistry and materials science for over 20 years. He has recently been involved with the development of multi-scale computational approaches to facilitate the accurate modelling of catalytic and defect processes in oxide and semiconducting materials. Dr Aron Walsh is a Marie Curie Fellow at University College London with a long standing interest in energy materials following postdoctoral work at the National Renewable Energy Laboratory (USA) where he still maintains close links. He has applied electronic structure techniques to the design of novel solar cell and solid-state lighting materials, and has pioneered a new field of theoretical research into semiconducting metal organic frameworks.